Below are picks chosen by PRX editorial staff. You can see all potential pieces for American Diabetes Month by using our search. November is American Diabetes Month and this award-winning program tells first-person stories from the Type 2 diabetes epidemic. Health Care Reporter Pauline Bartolone profiles challenges faced by an African American mother, a Native American amputee and a Hmong family. Their stories illustrate the importance of culturally based approaches. 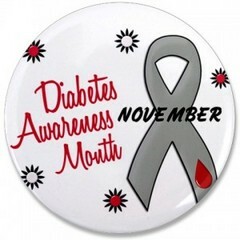 It's estimated that about 25 million American adults have diabetes, a disease that's preventable in most cases. Type 2 diabetes is hitting hardest in communities of color, where access to health care and health choices can be limited by income, education and geography. For many people in these communities diabetes isn't just a diagnosis, it shapes who they are and how they live their lives. Some are simply coping with the disease, trying to manage its impact. Others are evaluating the choices they've made in life with the goal of getting healthier today and in the future. And a few are teaching, trying to help family, friends and neighbors make better health decisions. Among California's African American, Native American, Latino and Hmong communities, a diagnosis of diabetes can have life threatening consequences. This multimedia program examines how three ethnic communities in California are dealing with diabetes and how culturally-based approaches to health care are lengthening and saving lives. Multimedia content includes videos, slideshows, info-graphics, links and resources as well as transcribed expert interviews. We encourage you to link to this site or embed videos on your station site as long as the Capital Public Radio logo remains intact at the end. You may also use the included photos with proper attribution. what does halloween mean to a diabetic kid - when you take away the candy? This is a short story on the way diabetics experience Halloween. It is a lighthearted look at the relationship between diabetics and candy, and the nature of Halloween pre and post-diagnosis. It aired on show #43 of Radio Anyway, a community radio program based in Traverse City, Michigan. When insulin was first discovered more than 80 years ago, everyone thought it was a cure for diabetes. Turns out, the disease was more complicated. Gladis Dull of Walla Walla was one of the first people to get an insulin shot. At 90, she has also likely survived on insulin longer than anyone else in history.